This tutorial provides you with a foundation for working with the navigator in Adobe Photoshop Elements. It is the second lesson in the Adobe Photoshop Elements 10 Digital Classroom book. 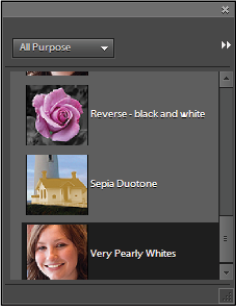 Photoshop Elements is a tool-rich program, and there are tools for accomplishing nearly any task. There are more than 40 tools available in the panel, and they are grouped together based on similarity. Tools with similar names and functions are stored together in tool groups. There are almost 50 tools stored in the Toolbox. Key commands to access the tools using your keyboards are listed in parentheses ( ). In this next exercise, you will use several tools in order to become more familiar with changing brush sizes or selections. The Red Eye Removal tool analyzes a selection by searching for red spheres, and removes any red areas it finds. It converts the red in the pupils to a neutral black color. The red eye phenomenon is almost always visible in photographs taken at night with a flash. It is actually caused by light reflecting off the back of the eyes. Many cameras now come with a red eye reduction feature, which causes the flash to go off twice, once right before the picture is taken and a second time to actually light the picture. The first flash causes the subject’s pupils to contract, which helps to reduce red eye. 1 In the Organizer, locate and select the red_eye.jpg file. The image contains an image of a man with red eye. You will use the Red Eye Removal tool to remove the red from his eyes. Before using the Red Eye Removal tool. 2 Press the arrow to the right of the Fix tab and choose Full Photo Edit from the menu that appears, or use the keyboard shortcut, press Ctrl+I (Windows) or Command+I (Mac OS). 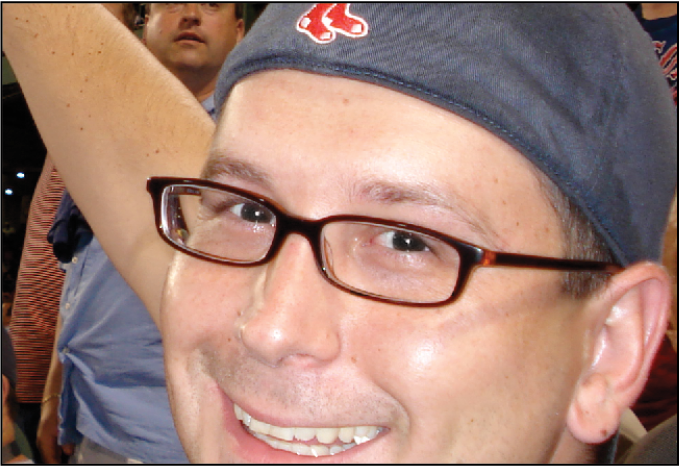 3 Choose the Zoom tool ( ) from the Toolbox, then click the person’s face to zoom in. If you zoom in too far, you can hold the Alt (Windows) or Option (Mac OS) key and click to zoom out. You can also use the Navigator to zoom in and out. 4 Choose the Red Eye Removal tool ( ) from the Toolbox. 5 Click and drag a selection around the first eye. If it doesn’t work on the first pass, try it again. You can also try simply clicking on the pupil with the Red Eye Removal tool. In the Options bar, you’ll also notice options for Pupil Size and Darken Amount. Each picture will present a different circumstance. Try adjusting these values to achieve the results you are looking for. 6 Select an area around the second eye to instantly remove the red from it. After using the Red Eye Removal tool. 7 Choose File > Save. In the Save As dialog box, type red_eye_working in the Name text field and change the format to Photoshop. Press Save. 8 Choose File > Close. If you are asked to save the changes, press No. In this exercise, you will use the Smart Brush tool to whiten someone’s teeth. You will also discover how to make a good selection and use an adjustment layer. 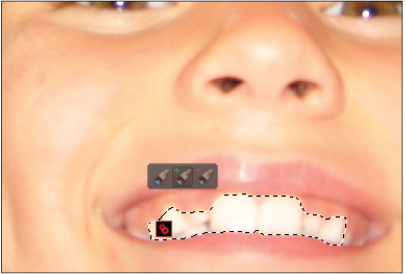 1 In the Organizer, locate and select the pearly_whites.jpg file. The image contains a little girl whose teeth are about to be whitened. 2 Press the arrow to the right of the Fix tab, then choose Full Photo Edit from the menu that appears, or use the keyboard shortcut, Ctrl+I (Windows) or Command+I (Mac OS). 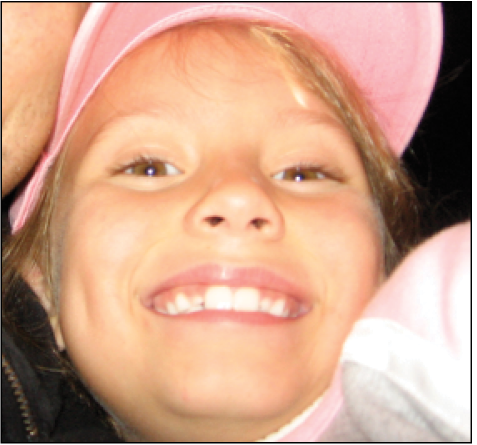 3 Choose the Zoom tool ( ) from the Toolbox, then click the girl’s face to zoom in. 4 Choose the Smart Brush tool ( ) from the Tools pane. The Smart Brush tool panel opens. Scroll to the bottom of the list and choose Very Pearly Whites as the Brush style. 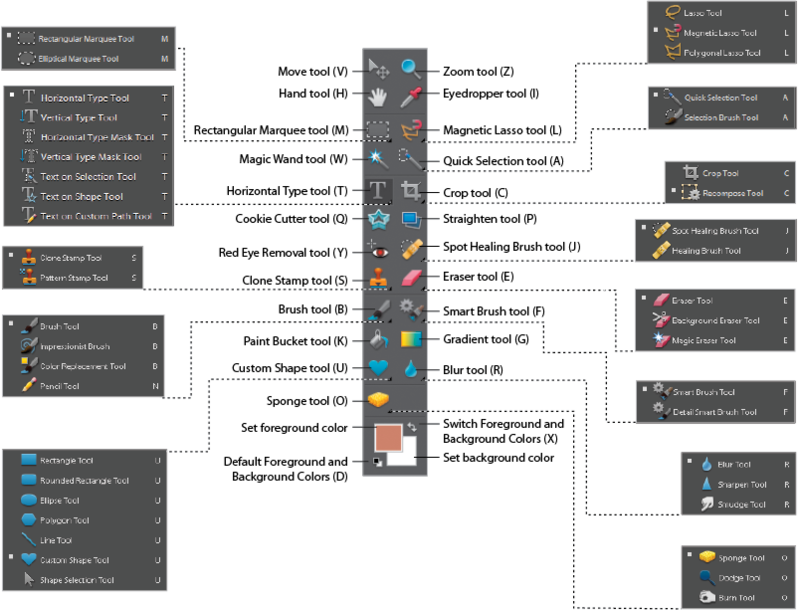 This is the Smart Brush tool options panel. 5 Click and drag the brush on the teeth, being careful not to select outside the teeth. 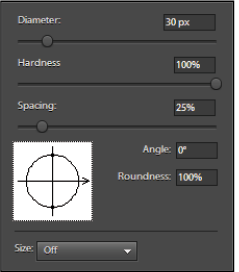 If you need a smaller brush, choose a smaller brush size, or use the slider to choose a smaller diameter from the Brush drop-down menu in the Options bar. Don’t worry if you selected too much; you’ll fix the selection in the next step. You can also use the [ ] bracket keys on the keyboard to change the brush size. Notice the small toolset that appears above the selection. The first brush is for starting a new selection from scratch. The second brush lets you add to a current selection, and the third brush lets you subtract from a selection. 6 Choose the Subtract from selection brush (the third button). Adjust your brush size if needed, then subtract from the selection so that only the teeth remain selected. 8 Choose File > Save. In the Save As dialog box, type pearly_whites_working in the Name text field and change the format to Photoshop. Uncheck the Save in Version Set with Original checkbox. Press Save. Because an adjustment layer was used, the original image has not been modified. 9 Choose File > Close. If you are asked to save the changes, press No.